President Franklin Roosevelt signs the Wheeler-Howard Act, better known as the Indian Reorganization Act, which pushes tribal governments to adopt U.S.–style governance. 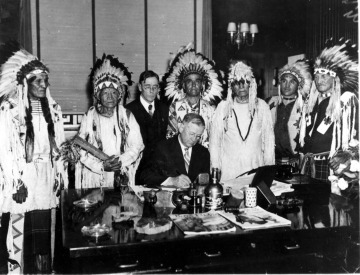 The Indian Reorganization Act (IRA) offers federal subsidies to tribes that adopt constitutions like that of the United States and replace their governments with city council–style governments. The new governments lack the checks and balances of power that had inspired the Founding Fathers of the United States. The transcripts from hearings on the IRA quote American Indian elders questioning the format of the IRA governments. “While a number of opportunities for Indian revitalization were initiated under the IRA, its promise was never fully realized. The era of allotment had taken a heavy toll on tribes. Many of the old customs and traditions that could have been restored under the IRA climate of cultural concern had vanished during the interim period since the tribes had gone to the reservations. The experience of self-government according to Indian traditions had eroded and, while the new constitutions were akin to the traditions of some tribes, they were completely foreign to others. The new constitutions called for election of council members and were based on the old 'boss farmer' districts, which had been drawn when the allotment policy dictated that the Indians would be taught to farm. Familiar cultural groupings and methods of choosing leadership gave way to the more abstract principles of American democracy, which viewed people as interchangeable and communities as geographical marks on a map.